Fantastic Advertised Income 2017: $373,034.00 / w Owner Weeks Added $404,065. See Interactive 3D Virtual Tour Link. "Summer Moon".Simply Dazzling.Created to Inspire You..Made to Enhance You. Being on the Ocean at Summer Moon, gives You Natures Oceanfront Beauty at its Best. Glorious amounts of glass windows provide a multitude of Ocean Views, capturing a transcendence quality, with the splashing surf dancing before you. 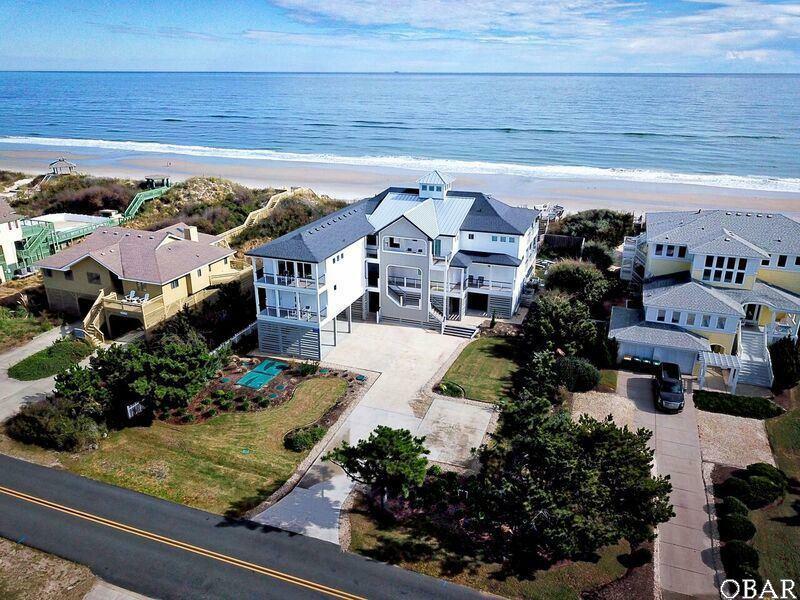 The inviting flow of this Oceanfront Beach Home embraces you with excitement, as the Top Level Entertainment Arena, is like Command Central for FUN ! Cascading Copula Chandelier swirls sparkles as an elegant essence radiates from the magnificent Ocean Views. 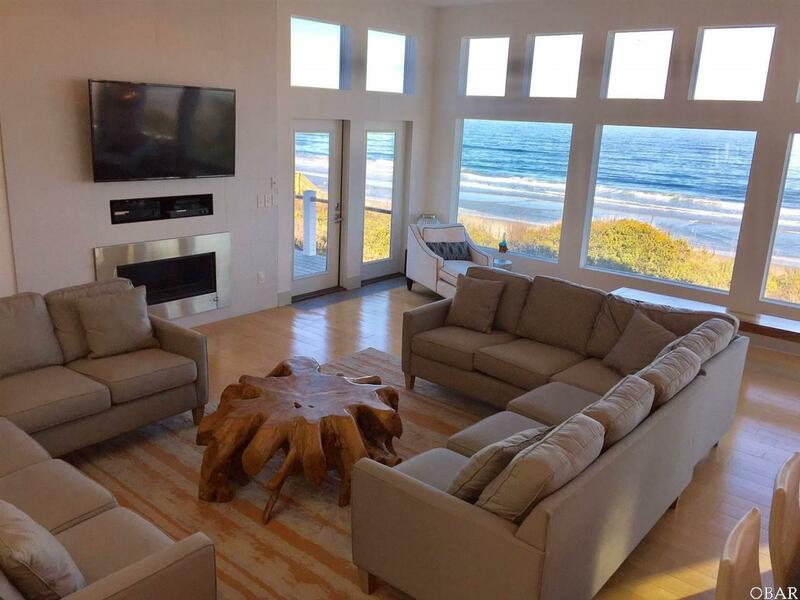 The Top Level boasts of these Entertainment Arenas: Incredible unobstructed Ocean Views ! 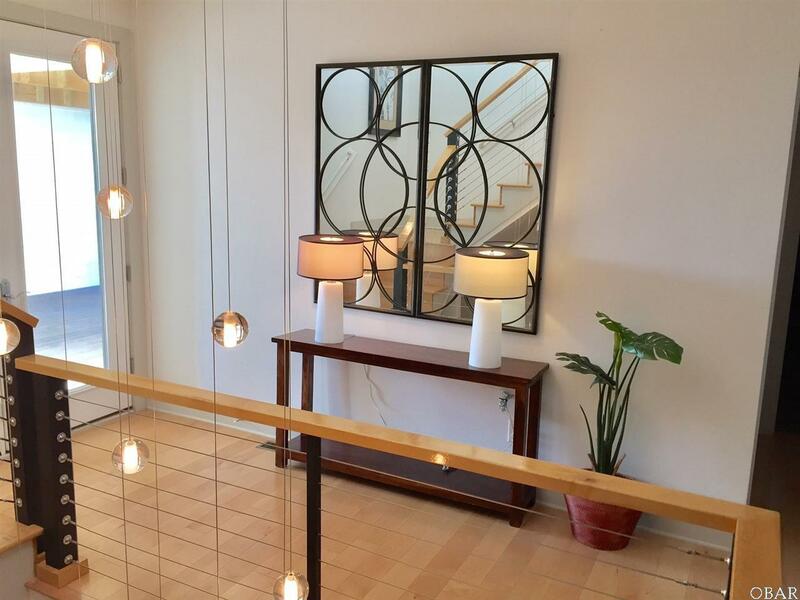 The Living Area with an easy light Fireplace, creating a warm glow. Majestic Dining Table for Twenty with grand Ocean Views. Huge adjacent Kitchen convenient to all the action. A Wet Bar with Wine Cooler, Ice Maker, and cabinetry of glassware to choose from, for your libation to be refreshing and immediate. A separate private Recreation Room, also with Ocean Views. And Four Master Bedroom Suites. As the Ocean Waves are splashing on shore of the wide Beautiful Beach of Corolla, you see and hear the Ocean from all angles. Two Oceanfront Decks are also immediately adjacent to the Great Room, to open for the Ocean Breezes or to move outdoors. Just seconds from the Great Room activities, You have access to the private Top Level Recreation Room with Billiards & Foosball, Video Games, More Flat Screen TVs, another Kitchenette; all of which is so easy to keep up with all the action in these multiple festive locations. Of the Twelve Master Bedrooms, Four are on the Top Level, and Eight are Mid Level, many with Ocean Views too. Of the 12 Bedrooms, ALL 10 Adult Master Suite Bedrooms benefit from Private Bathrooms with beautifully Tiled Showers; plus Access to Outdoor Decking. Then Two Bedrooms with Bunks are also Master Suites. Convenience of the Elevator makes Life Easy. Then, tucked away also on the Mid Level, is the separate Theater Room / Bridal Suite to enjoy movies or the big game ! Outdoors there are even more additional Decks and Lounge Chairs at the Top Level, Mid Level, Dune Top, Poolside, and around the outdoor Fire Pit, too. At Poolside, the Pool Fountains, Wet Bar with Two Full Size Refrigerators, Large Flat Screen TV and an abundance of Cushioned Sofas, lets the party continuously flow from the Top Level to the Poolside Level. Summer Moons uniquely special design flow, does wonders at maximizing Ocean Views from so many Living Areas, Bedrooms, Decks & Dunes ! 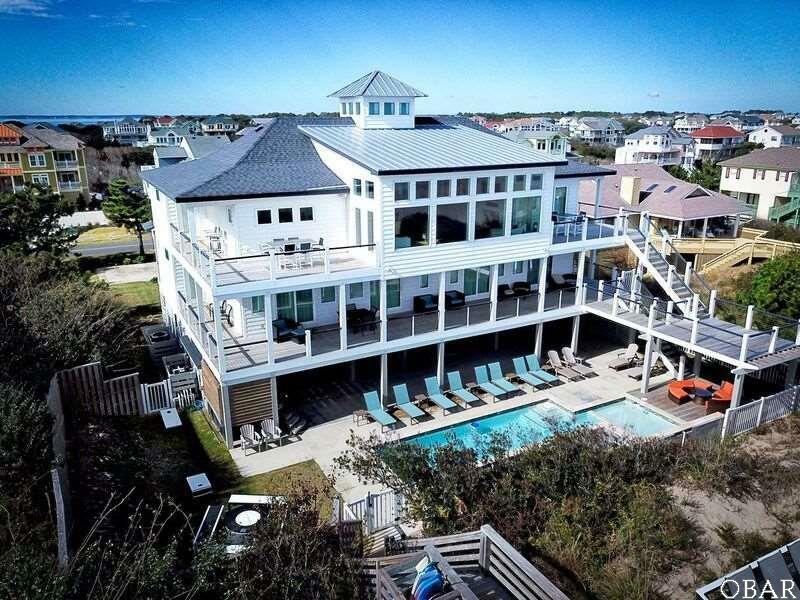 Day or Evening, Summer Moon is a paradise setting, with expansive Ocean Views that are a rich vibrant hue, with surf pulsating with a passionate vigor, onto a glistening sand beach, to stroll along for milesall of which makes this shorefront Beach Home as "One to Cherish. The Top of the Dune Deck and Lounge Area, is perfect to enjoy refreshments and to be revitalized by the tropical ocean breeze. Various outdoor seating and decking provides a multitude of perspectives to enjoy the ocean essence. All separate, yet close, to easily re-engage in all the action. The Pool offers many ways to enjoy the water with a shallow pool section; to the in-pool seating; fountains cascading as waterfalls, and a deep water section for total immersion. In addition and adjacent to the Great Room and Dining Area is the huge Kitchen, with Dual Refrigerators, Dual Sinks and Counters, Dual Ovens, Dual Dishwashers; Microwave and Six Burner Instant Heat Gas Stove; GE High Caliber Appliances.even the Kitchen gets the splendor of more Ocean Views. Summer Moons quality is ideal for Weddings, Family Re-Unions, Conventions, and Loved Ones. Luxury Furnishings abound, beckoning you to relax. Summer Moons fantastic design makes it so delightful to just become part of the Oceans magnificence enriching your soul.